This paper proposes an alternative predictor for the total claim amount of individuals that can be used for any type of non-life insurance products in which individuals may have multiple claims within one policy period. The impact of heterogeneity on expected total claim amount is investigated focusing on marginal predictions. Generalized linear mixed model (GLMM) is used for the amounts of loss per claim. Closedform expression of the predictor is derived using marginal mean under GLMM and claim count distribution. Empirical studies are performed using a private health insurance data set of a Turkish insurance company. Proposed predictive model provides the lowest prediction errors among competing models according to the mean absolute error criterion. Acar Şentürk, A. Impact of heterogeneity on aggregate loss models in health insurance, Ph.D. Thesis, Department of Actuarial Sciences, Hacettepe University, Turkey, 2016. Anderson, D., Feldblum, S., Modlin, C., Schirmacher, D., Schirmacher, E., Tahndi, N. A Practitioner's guide to generalized linear models, Casualty Actuarial Society 2004 Discus- sion Papers 1-116, Arlington, Virginia, 2004. Antonio, K. and Valdez, E. A. Statistical concepts of a priori and a posteriori risk classification in insurance, AStA Advances in Statistical Analysis, 96(2), 187-224, 2012. Boucher, J. P., Denuit, M., Guillén, M. Risk classification for claim counts:A comparative analysis of various zero-inflated mixed poisson and hurdle models, North American Actuarial Journal, 11(4), 110-131, 2007. Breslow, N.E. and Clayton, D.G. Approximate inference in generalized linear mixed models, Journal of the American Statistical Association, 88(421), 9-25,1993. Brockman, M. J. and Wright, T. S. Statistical motor rating: Making effective use of your data, Journal of the Institute of Actuaries, 119(03), 457-543, 1992. Cameron, C. A. and Trivedi, P. Regression analysis of count data, Econometric Society Monographs, 2nd edn, (New York: Cambridge University Press, 2013). De Jong, P. and Heller, G. Z. Generalized linear models for insurance data, (Cambridge University Press, 2008). Diggle, P. J., Heagerty, P., Liang, K. Y., Zeger, S. L. Analysis of longitudinal data, 2nd edn., (New York: Oxford University Press, 2002). Edwin, T. K. Power series distributions and zero-inflated models, Doctoral Dissertation, University of Nairobi, 2014. Fitzmaurice, G. M., Laird, N. M., Ware, J. H. Applied longitudinal analysis, (New Jersey: John Wiley & Sons, 2004). Flynn, M. and Francis, L. A. More flexible glms zero-inflated models and hybrid models, Casualty Actuarial Society, 148-224, 2009. Frees, E. W., Gao, J., Rosenberg, M. A. Predicting the frequency and amount of health care expenditures, North American Actuarial Journal, 15(3), 377-392, 2011. Fu, L. and Moncher, R. B. Severity distributions for GLMs: Gamma or lognormal? Evi- dence from Monte Carlo simulations, Casualty Actuarial Society Discussion Paper Program, 149-230, 2004. Grömping, U. A note on fitting a marginal model to mixed effects log-linear regression data via GEE, Biometrics, 52(1), 280-285, 1996. Gschlöÿl, S. and Czado, C. Spatial modelling of claim frequency and claim size in non-life insurance, Scandinavian Actuarial Journal, 2007(3), 202-225, 2007. Klugman, S. A., Panjer, H. H., Willmot, G. E. Loss models: From data to decisions, 2nd edn., (New York: John Wiley & Sons, 2004). Lambert, D. Zero-inflated Poisson regression, with an application to defects in manufac- turing, Technometrics, 34(1), 1-14, 1992. Liang, K. Y. and Zeger S. L. Longitudinal data analysis using generalized linear models, Biometrika, 73(1), 13-22, 1986. McCullagh, P. and Nelder, J. A. Generalized linear models, 2nd edn., (London: Chapman and Hall, 1989). Molenberghs, G. and Verbeke G. Models for discrete longitudinal data, (New York: Springer, 2005). Mouatassim, Y., Ezzahid, E. H. Poisson regression and zero-inflated Poisson regression: Application to private health insurance data, European Actuarial Journal, 2(2), 187-204, 2012. Mullahy, J. Specification and testing of some modified count data models, Journal of Econo- metrics, 33(3), 341-365, 1986. Ohlsson, E. and Johansson, B. Non-life insurance pricing with generalized linear models, (Berlin: Springer, 2010). Pinheiro, J.C. and Bates, D.M. Approximations to the loglikelihood function in the nonlinear mixed-effects model, Journal of Computational and Graphical Statistics, 4(1), 12-35, 1995. Raudenbush, S. W., Yang, M. L., Yosef, M. Maximum likelihood for generalized linear models with nested random effects via high-order, multivariate Laplace approximation, Journal of Computational and Graphical Statistics, 9(1), 141-157, 2000. Renshaw, A. E. Modelling the claims process in the presence of covariates, ASTIN Bulletin, 24(2), 265-285, 1994. Schulz, J. Generalized linear models for a dependent aggregate claims model, Master's The- sis, Department of Mathematics and Statistics, Concordia University, Montreal, Canada, 2013. Wedderburn, R. W. M., Quasi-likelihood function, generalized linear models and the Gauss- Newton method, Biometrika, 61(3), 439-447, 1974. Yip, K. C. H. and Yau, K. K. W. On modeling claim frequency data in general insurance with extra zeros, Insurance: Mathematics and Economics, 36(2), 153-163, 2005. Zeger, S. L., Liang, K. Y., Albert, P. S. Models for longitudinal data: A generalized estimating equation approach, Biometrics, 44(4), 1049-1060, 1988. ISNAD Şentürk Acar, Aslıhan , Karabey, Uğur , Gregori, Dario . "Incorporating heterogeneity into the prediction of total claim amount". 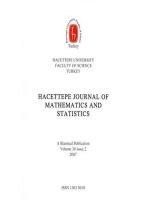 Hacettepe Journal of Mathematics and Statistics 47 / 5 (October 2018): 1321-1334.